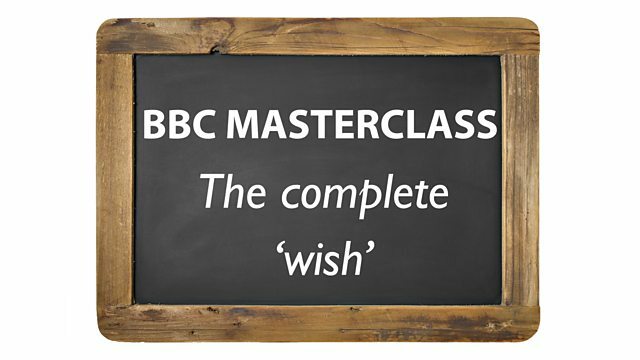 In this Masterclass, Dan's going to show you the complete use of the verb 'wish'. The word 'wish' has 5 uses in English - and today we're going to cover them all! I wish I wish I wish I wish I wish… Oh! It only works if you know the grammar rules! I completely forgot. So here is the complete ‘wish’. Wish has five uses in English and today we’re going to cover them all. Are you ready? Go! 1. Wish for present or past that isn’t real. This is the most common form of wish. It’s when we wish for a situation in the present or past to change, but we know that it can’t change because it’s impossible. ‘I wish I were taller.’ (because I am not tall) Or: ‘I wish I had eaten ice-cream for breakfast this morning.’ (because I didn’t eat ice cream for breakfast this morning). I wish I had eaten ice-cream for breakfast this morning is an example of a past wish. This morning is a past time; we make a past wish. ‘Wish’ is followed by the past perfect, which is had plus the past participle. That indicates true past time. Did you get it? 2. Wish for an irritation that can change. However, in terms of an illness or an addiction, this form is fine. When I say 'I wish I would stop smoking' it means 'I don’t want to smoke anymore, but I can’t stop because I’m addicted.' Someone give me a cigarette! Did you get it? We can also use wish followed by ‘for’ to attach an object that you want. And this is most often used in the circumstances of magic. For example: ‘I wish for a pizza.’ Got it? 4. Wish to send ‘good vibrations’. ‘I wish you luck for your exam tomorrow.’ or ‘We wish you a merry Christmas.’ Got it? 5. Wish for the future. Got it? Did you get it? Of course you got it! Now for more information please log on to bbclearningenglish.com. I’ve been Dan, you’ve been fantastic. I hope to see you next time, ok? Now. I wish I wish I wish I wish I wish… it works! Hahahaha! 1. 'Wish' for a present or past that isn't real. This use of wish is for present or past situations that we want to change, but we understand that they can't. I wish I had eaten ice-cream for breakfast this morning is an example of a past wish. 'This morning' is a past time; we make a past wish. ‘Wish’ is followed by the past perfect, which is 'had' plus the past participle. That indicates true past time. I wish you weren't so selfish. I wish I hadn't left my keys at work. Do you wish you knew how to drive? Do you wish you had worked harder at school? 2. 'Wish' for an irritation that can change. I wish you would make the bed! I wish people wouldn't throw litter on the street. I wish you would make the bed. Thismeans ‘I think you can, but you don't, so please do'. However, in terms of an illness or an addiction, this form is fine. When I say I wish I would stop smoking it means 'I don’t want to smoke anymore, but I can’t stop because I’m addicted'. 4. 'Wish' to send ‘good vibrations’. I wish you luck for your exam tomorrow. 5. Don't use 'wish' for the future. I hope you will pass your exam. A quiz based on the video "The complete wish"
Choose the correct sentence for each 'wish' situation. When didn't you study? Is it in the present or the past? Which form of 'wish' is needed for a past wish? You are taking an exam, but you didn't study last night. Which of these wishes is correct for your situation? If you want to send 'good vibrations' to someone, how do you do it? How many objects do you need to use? You want to send a pleasant message to your friend about their birthday. Which of these is correct? Is this a present or past wish? Which form of 'wish' means 'want'? You would like to speak to the headmaster of the school. You want to be formal and polite. What do you say? Your friend could change, if they tried harder. Which form of 'wish' do you use for a changeable situation? You are annoyed that your friend always arrives late. What do you say? Look at the verb after 'wish'. What form does it take? What does this mean? How do we use 'wish' in the future? Do we need any other words? That wraps up this week’s Masterclass. We hope that it has been useful, and we wish you all the best in your studies! Join us in Session 2 for News Review, where you can pick up key language from the latest stories and find out how to use it in your everyday English. Wish + past tense verb (present wish) OR wish + had + past participle verb (past wish). Use this for present or past situations that we want to change, but can't. I wish I had eaten ice-cream for breakfast this morning. Don't say: I wish I would... unless you have an addiction or illness. I wish I would stop smoking! 5. Use 'hope' instead of 'wish' for the future.